Don't panic yet, but the Blackhawks have been floundering quite a bit lately, having lost 5 of their last 6. This includes a heartbreaking shootout defeat at the hands of the Minnesota Wild on Sunday, after a hard-fought comeback to tie the score in regulation. Talk about deflating. With that in mind, I may have subconsciously picked up a few new cards of netminders on Ebay recently. Well, I definitely DID pick up the cards, I just didn't put it together that all three men were goalies until I got the envelope. Silly subconscious! In other coincidental news, all three cards hail from the same set as well: 2002-03 Topps. Again, that wasn't necessarily a goal, it just so happened that all three guys needed representation in my Blackhawks All-Time Roster binder and all were available for about 10 cents with free shipping. You can't beat that deal. 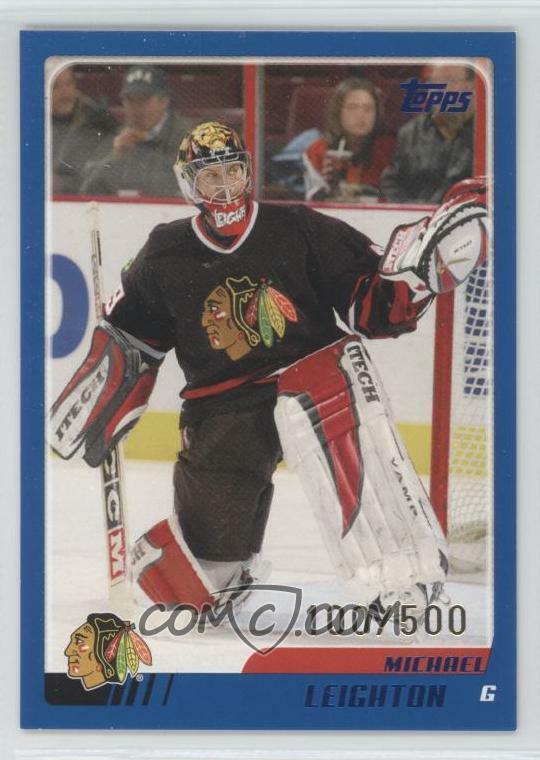 Lalime served as the backup to Nikolai Khabibulin during his two season stint in Chicago (06-08). All told, he played in 44 games for the Blackhawks, going 20-18 with an .897 save percentage. Pretty forgettable. 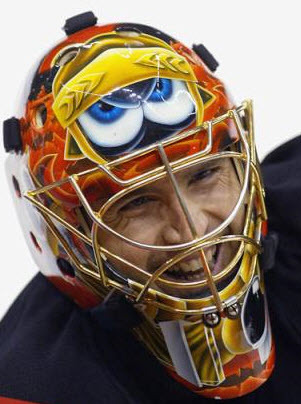 Patrick was much more notable for his goalie mask theme - cartoon eyes - which you can see in the picture above. In Pittsburgh, the googly eyes were found on a Penguin; meanwhile, in Ottawa and St. Louis they were on Marvin the Martian. Marvin stuck around in Chicago, but an Indian headdress was added on top of the Martian's head. When wrapping up his career in Buffalo, Marvin gained the horns of a buffalo. 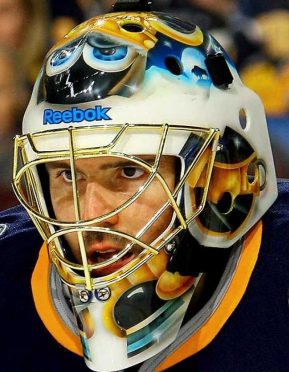 Who doesn't love a fun goalie mask, right? Lalime missed the beginning of the 2006-07 season due to a herniated disc and was kept on injured reserve until February. As a result, the man you see above, Brian Boucher, became a Chicago Blackhawk; after all, they still needed a backup goaltender. Boucher was a gun for hire, having never played for the same team longer than three seasons in his 13 season career. 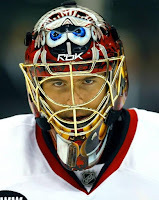 His Chicago tenure was brief, only 15 games, and also wildly unsuccessful, 1-10 with an .844 save percentage. I'm sure no one shed a tear when he was claimed of waivers by Colorado. As short and rough as his stint was, he was still a Hawk and thus needed a card for my all-time tome. 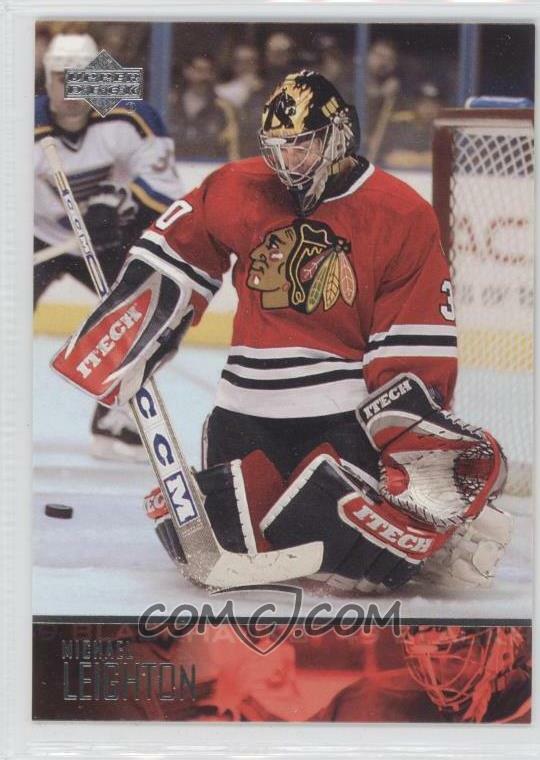 And now, the only actual Blackhawks card of the lot was Jocelyn Thibault, the starting goalie from 1998 through 2004. His best season came during this time, when he recorded eight shutouts and made an appearance in the NHL All-Star Game during the 2002-03 campaign. Along the way, he recorded his career best GAA of 2.37 and a save percentage of .915. It's just a shame that his best years were wasted on some of the worst hockey teams in Chicago history. This was the last card of my coincidental or subconscious goalie binge. 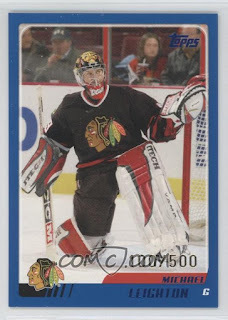 Although, my next target is Michael Leighton, a goalie who was a Hawk from 2002-04 and just recently returned to replace Crow on the active roster. Still, despite all the issues the Blackhawks have been having during this recent stretch, I wouldn't say it's time to panic. It's easy to become spoiled with all of the success this team has had since Stan Bowman took over the franchise reigns; rough stretches happen to even the best of teams. They're pretty much assured of a playoff spot, which is really all that matters. That said, I'd really like it if they could get back on track with a win over the Central Division leading Stars tonight - it would make for a nice statement. 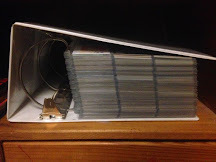 In the interim, I'm going to do my best to mind my subconscious urges - this time it was just buying a batch of goalie cards, but next time it could be something crazy, like buying a llama. Nice, Rhode Island's own Brian Boucher! 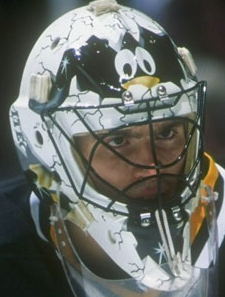 I got to see a good bit of Lalime during his Pittsburgh days. He ended up having a pretty long career. The Penguins have been trending the other way. They are playing their best hockey of the year. They went from barely holding onto a playoff spot to maybe getting a home advantage for a series. We had llamas for a while on the family farm. I never liked them much. I'd buy goats or a pygmy goats instead. Or chickens. I'm of course as disappointed as you with the way things have been going. The whole year, minus the 12 game winning streak, has been inconsistent. A few things give me hope for the playoffs--Coach Q, lots of playoff experience, and the team has always played well on the road. Let's hope they just stay healthy. That hit last game on Kaner was scary. I thought he may have had a concussion. Boucher grew up about 5 miles away from where I live and played his high school hockey at Mount St Charles Academy in Woonsocket RI. The school is famous for winning 26 years in a row the RI state championship for hockey and has a few kids from there make the NHL. Did these cards come from Derrick? This PWE Was a Hoot! I Couldn't "Just Say No"